At the end of each summer in the Myrtle Beach area, the crowds grow smaller, and the temperatures grow cooler. While everyone loves the excitement of the summer months, it is the winter that makes the beach city a cozy place for relaxation and rest. Even though the weather tends to get cooler from December to March, winter temperatures in Myrtle Beach are very mild, and days are most frequently filled with crisp, blue skies. A walk on the beach is definitely not out of the question during your winter stay, so bring your sandals along! 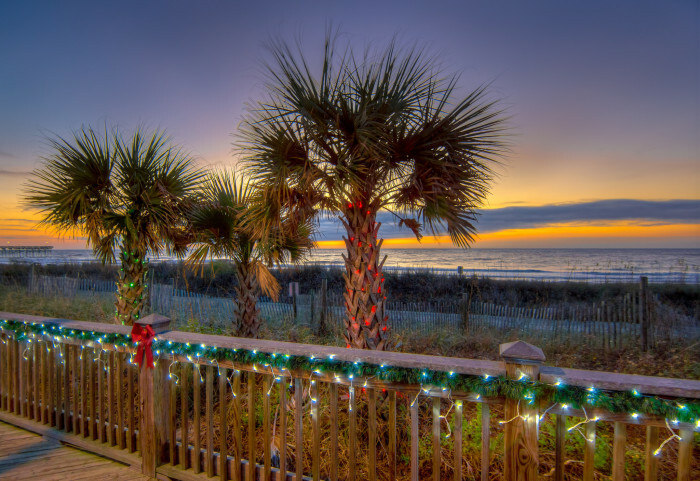 There's no better way to escape the snow and bitter cold of your hometown than by spending the winter months in beautiful Myrtle Beach, South Carolina. If you're worried about finding something to do in the "off-season," put your mind at ease! Despite the drop in tourist traffic, a majority of the most beloved attractions remain open throughout the year. Spend a sunny day playing miniature golf at one of the many courses open year-round, or take a walk around the lake and park at the stunning Market Common. Myrtlewood Villas is just a short drive away from many of the best attractions in the area like Broadway at the Beach and the Myrtle Beach Boardwalk, not to mention the bevvy of restaurants in the surrounding area. There are so many options to choose from, and Myrtlewood's location in the heart of Myrtle Beach makes it the perfect destination for long-term renters. With all of the excitement of Myrtle Beach right at your door, you are sure to love your monthly stay with Myrtlewood Villas. Whether taking an extended vacation or looking to get away for the winter, Myrtlewood Villas is the perfect place to make your home away from home. Monthly rentals at Myrtlewood provide you with all of the comforts of home, including furnished units with fully-equipped kitchens, while also having the chance to enjoy the mild temperatures, thrilling attractions, and relaxing atmosphere of Myrtle Beach. Throughout your long-term stay, take advantage of the resort's amenities, including the new indoor pool and fitness complex. At Myrtlewood, you'll have the luxuries of home plus the conveniences of a resort.